One of the fundamental tensions in the contemporary world has been between traditional societies and modernity. “Traditional societies” refers to those who are connected to traditional communities or cultures. This includes accepting received religious beliefs and/or scriptures, loyalty to community leaders, and shaping one’s life based on how things were done in the past. “Modernist societies,” on the other hand, refers to those societies who have faith in science, modern social institutions like the bureaucratic state, and those who want to build a new and different future based on reason and discovery. Social change is inevitable. There are demographic changes, technological changes, changes in the natural environment, and more. Traditional ethnic and national groups are constantly bumping up against one another, infringing on territory. Some groups suffer from environmental impacts made by other groups. New technologies and social institutions create lifestyle changes. Traditionalists are more likely to resist these changes, while modernists are more likely to advocate change. The tension between tradition and modernity can lead to constructive change and adaptation, but often it leads to civil war and strife. This depends on the people involved, and whether they are willing and able to adapt. Whether people have a traditionalist or a modernist orientation, they can act peacefully or violently based on the maturity of their social consciousness. In normal human development, social consciousness expands with age, education, and experience. A child is first only aware of himself or herself and is unable to feel empathy for others. Next comes awareness of one’s social group and the group identity its cultural norms and language provide. Group identity fosters transcendence of the self. Finally, a mature person should be able to recognize that there is a wider world beyond various social groups and develop a social consciousness that transcends group consciousness. While it is normal to associate traditionalism with group consciousness, modernist group identities also reveal the same psychological tendencies that inhibit the transcendence of group identity. In other words, the narrowness of a fundamentalist Christian or fundamentalist Muslim can be compared to the narrowness of a Darwinist or Freudian who adopts a reductionist worldview around which the entire world rotates. We often refer to a “good” person as one who transcends himself and recognizes the needs of others and supports society as a whole. The idea of a “good” person is further expanded when one transcends group loyalties, as in Jesus’ parable of the good Samaritan who stopped to help a Jew who had been beaten by the robber. The rabbi who passed the man by would be considered “bad” compared to the man who helped. Thus, there are “good” and “bad” traditionalists, and there are “good” and “bad” modernists. Neither tradition nor new discovery is inherently evil; societies require both. Human beings are largely creatures of habit, and cultures help form those habits even before the rational and critical capabilities of the brain begin to function. However, as human beings mature they begin to compare their inherited world with the world of their experience and, depending on the community they were raised in, some people might be better prepared for change than others. Some groups encourage their members to transcend group consciousness, others do not. We might say that a “good” tradition enables group transcendence, while a tradition that resists change too strongly is a “bad” tradition because it inhibits the ability of its members to experience group transcendence. Often leaders and groups who are more concerned about themselves and their own power rather than the fulfillment of the lives of their members discourage group transcendence and promote in-group/out-group or us/them social consciousness. Change can be seen as exciting or threatening. In a society with a mature tradition, people rise to challenges and welcome constructive changes. The societies that do this the best adapt and continue, while those who do not are relegated to the dust bins of history. Unfortunately, inability to transcend group consciousness can produce reactionary and revolutionary behaviors. There are those who are unable to transcend group identity and integrate change with tradition and promote the peaceful transformation of society. Both traditionalists and modernists have proven capable of great violence, even genocide, violating human rights, and causing massive human suffering and death. This is especially true when traditionalists and modernists take sides, blaming the “other” as the source of a social ill and desiring to kill members of that group, rather than seeing complexity, shades of gray, and accepting others’ human rights and the valid insights that they have. From this perspective, the violent revolutions proposed by Communists and the violent fundamentalist attacks by Islamists are both childish reactions to the need for constructive change. They both reflect the inability to transcend a limited consciousness. While one side is on the extreme political right and the other on the extreme political left, they both refuse to recognize the human rights and ultimate value of other. The one “bad” rejects tradition and the other “bad” rejects progress. The second article, by Oladapo Kayode Opasina, looks at traditional institutions and the challenge of modernity in Nigeria and Côte D’Ivoire. These two states were formed as colonies of Britain and France respectively. The British devolved more authority to traditional authorities in Nigeria while in Côte D’Ivoire there was an effort to make all people “French.” Traditional institutions in Africa have shown resiliency, especially when the state is perceived to be an avenue for exploitation and self-enrichment. Large populations continue to rely on traditional authorities. This article investigates factors that threaten the existence of traditional institutions in the face of modernity. 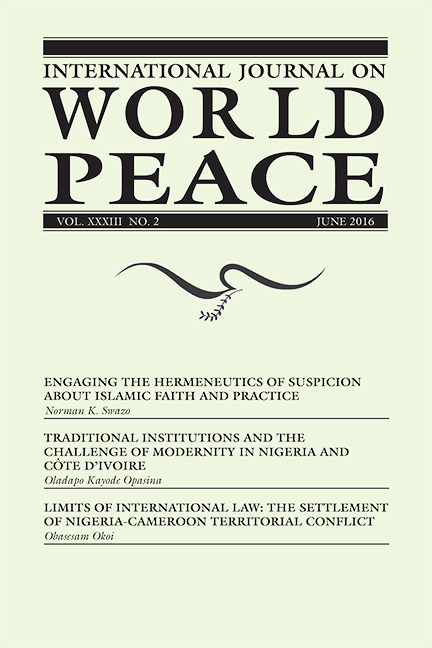 The third article, by Obasesam Okoi, looks at the limits of international law in state territorial conflicts. 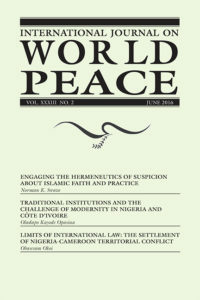 Using the case of the Nigeria-Cameroon territorial conflict in which a settlement was adjudicated by the Hague, Okoi notes that the doctrine of state sovereignty, a modern concept in the international community, created a situation in which traditional loyalties of people living with the result of the decision were largely ignored, and inadequately addressed. He argues that international law should be constructively revised following the unnecessary structural violence this settlement created for over 100,000 people who ended up in refugee camps and were virtually stateless. Okoi states that the international community also needs “self-transcendence” in that loyalty to it, and to its laws and doctrines, also can behave as a “group” albeit a very large group. The group mentality of the international community can also cause reactionary or revolutionary behavior if it is not mature and incapable of self-transcendence and revision. Perhaps part of the reaction against the United Nations by Islamists and other traditionalists is its tendency to view states, more than individuals, as sovereign. After all, its membership is states, and the Hague is designed to resolve disputes between states. There is a definite need for this, and it can be argued that the formation of the United Nations has inhibited the reappearance of global wars, like World War I and World War II. Nevertheless, the United Nations deals with leaders of states, many of whom have marginalized millions of people within their own states. The UN Universal Declaration of Human Rights attempts to set forth the rights of all people within all states, but when decisions are made by treaties between states, they have favored states, not citizens. For example, the Treaty of Portsmouth settlements, for which U.S. President Theodore Roosevelt was awarded a Nobel Prize, was a treaty between Russia and Japan that totally ignored the desires of the Koreans and Manchurians who wanted their own independence. While that treaty led to a new era of U.S.-Japanese relations, it also led to the brutal oppression of other national groups already living there. Today the Universal Declaration of Human Rights serves as a guide to prevent this, but the Nigeria-Cameroon Settlement by the Hague still came up short. A better recognition of the role of traditional society and face-to-face communities in natural human identity formation is important. States cannot do this, and certainly the United Nations cannot do this. Yet, there is a tendency to centralize power and to defer responsibility to higher levels of government. Such deference inevitably leads to anomie and depersonalization of life, yet modern states and the media continue to assume that everything should be done at the state level. Perhaps this reveals that contemporary states and media have yet to reach a maturity in social consciousness in which they can transcend their own group.